Danton, Robespierre, Saint-Just – the fate of these historical figures is well known. 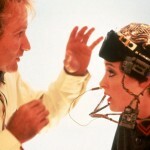 Consequently, Andrzej Wajda’s Danton, based on the play The Danton Case is inevitably defined by the very idea of doom. 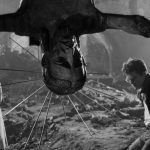 In the shadow of the guillotine, prominently framed at the beginning and at the end, the Polish filmmaker develops reflections on individual and collective failure, while luring the viewer into a claustrophobic atmosphere of despair. 1794, Paris. In a low-angle opening shot, we see the grim outline of a guillotine towering symbolically over the set. The opening’s focus, however, is on the arrival of a carriage. A sharp cut reveals the scaffold, contemplated in the next shot by the carriage’s passenger: Danton. 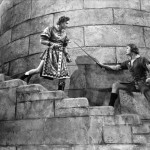 Framing and editing establish the link between the doomed character and his violent end, while the opening and closing image of the guillotine develops a narrative built on cycles of repetition. Georges Danton, magisterially played by Gérard Depardieu, is a personality of gargantuan dimensions whose lust for life is limitless. This famous revolutionary seems to be more interested in women, wine and good food than in politics – yet his buoyant personality is tinged with sadness and moments of apathy. 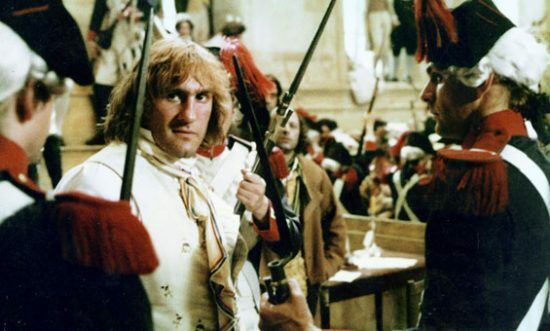 Depardieu’s magnificent performance reveals the many facets of his struggle perfectly. His voice rises when he turns on his accusers during a trial, yet sinks to a whisper when he talks to Robespierre about the failure of the revolution. Finally, his hoarse, almost inaudible voice cracking under the emotional strain perfectly portrays a tired giant worn out by the revolution. Danton eventually realises the the policy of oppression he has instigated – but too late, for the Reign of Terror is already in process. Danton’s energy and joie de vivre stand in sharp contrast to his rival Robespierre’s unbending personality. We don’t need Danton to tell us his rival will follow him to the guillotine: we know Robespierre can’t win. In one early scene, he feverishly rises from his sickbed; at the end, he is lying in bed with his face covered with a linen sheet, foreshadowing the image of corpse he will soon become. Robespierre’s downfall will not be the result of Danton, but of a doomed political system. Aware of his own limitations and the wrong turning the revolution has taken, Robespierre, driven by his own ideological credo, is unable to face this the reality of failure. His idealized vision of revolution and of mankind is an illusion. His ideals don’t fit reality – a reality marked by debauchery and corruption. 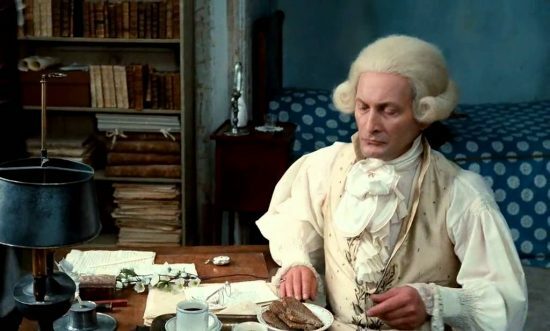 In one scene, Saint-Just offers Robespierre “real bread made with proper flour”, while the people of Paris are starving. The hungry queues outside the bakery are a reference to the socio-economic conditions in Poland and other communist countries, where people faced dire shortages of all kinds. Wajda connects communism and other dictatorships in the 20th century throughout the film, addressing issues such as the freedom of the press and political oppression. The secret police have installed their informers everywhere, and people are searched and arrested for the slightest criticism of the regime. Danton also recalls Stalinist purges and show trials in which the verdict is determined from the outset. Robespierre’s statement “We cannot afford justice” applies to many dictatorial regimes – and not just this final stage of the French Revolution. Framing, colour and music work to build a feeling of fear and claustrophobia which deepens as events unfold. The reduced colour scheme, dominated by shades of grey, blue and brown, evokes coldness and a world without empathy. The idea of a society plunged into darkness is supported all the more by Jean Prodromidès’ haunting musical score with its crescendi, and by the cacophony of voices in the crowd scenes which build a sense of deep anxiety and turmoil. 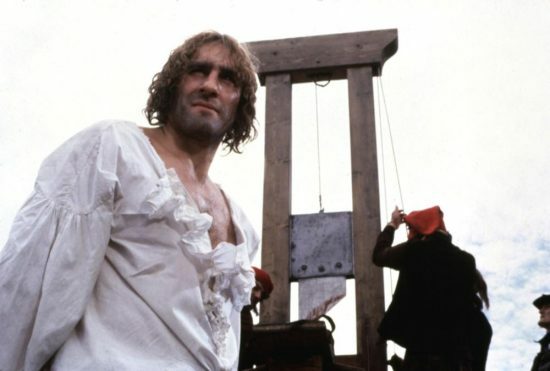 Danton deals with themes of betrayal and illusory ideals at the end of the eighteenth century in France, while alluding to more recent political events, including Polish history after World War II. The (communist) system is unmasked as a mere abstraction which does not take into account the basic needs of people. What might have been an honourable attempt to create equality has turned into a nightmare. At the beginning of the film, a young boy is trying to memorize the Declaration of the Rights of Man and Citizen. Now fully practiced, he’s sent in to recite. Does he truly understand the meaning of the words his sister has drummed into him? As he reads, Robespierre is fully brought to the reality of what he has done. Is democracy a mere illusion, as Robespierre states, or does the presence of the child offer a glimpse of hope?